The Management of Mastercoil is committed to the Quality Goal of 100% Conformance to Customer Requirements, while continually Striving to Improve the Effectiveness of the Quality Management System. Mastercoil will conform to requirements at all times. It is the established policy and intention of this company to provide its customers with products that conform to customer requirements and are delivered on time. This will be ensured through a defined quality management system as detailed in the company quality manual. Mastercoil Spring shall work with interested parties who demonstrate the same commitment to customer focus. We are also committed to continually improving all areas of our operations through employee development and involvement. 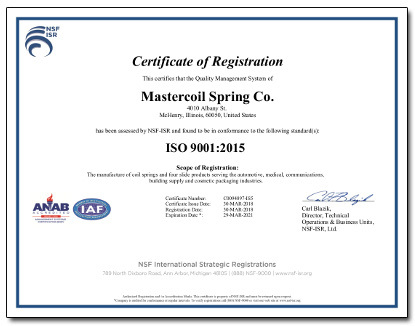 Mastercoil is committed to complying with the requirements of ISO-9001 and the Quality Management System to continually improve its effectiveness.